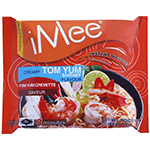 Make a hot steaming bowl of authenic premium instant style ramen noodles soup with this instant noodle package. Add slices of cooked meat, poultry a boiled egg, and vegetable for a more authentic texture. Authentic flavours range. Product of Thailand.